Rose J. Kuntz, 94, of Mandan, passed away January 29, 2019 at St. Vincent’s – a Prospera Community, Bismarck. Mass of Christian Burial will be held at 10:00 AM on Saturday, February 2, 2019 at St. Joseph Catholic Church, Mandan, ND with Rev. Jarad Wolf as celebrant. Burial will be at Mandan Union Cemetery. Visitation will be held Friday, February 1, 2019 from 5:00-8:00 PM at Weigel Funeral Home, Mandan, with a Rosary/Parish Vigil at 7:00 PM. Visitation will continue at the church one hour prior to the service on Saturday. 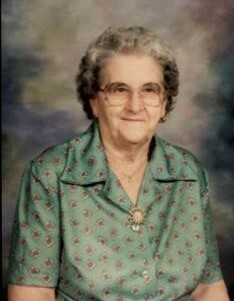 Rose J. Kuntz was born July 12, 1924 to Ernest and Regina Barnhard in Crown Butte, ND. On June 28, 1948 she married Mathias J. Kuntz in St. Anthony, ND. They farmed together in Solen until moving to Mandan in 1970. She worked at the Mandan Beanery and the Bismarck Elk’s. Rose could always be found in an apron as she poured her love into cooking, especially her German recipes that everyone enjoyed. Anyone who came to visit would be sure to get a hearty meal and no one ever went home hungry. She greatly enjoyed crocheting, spending time in her garden or watching one of her favorite game shows, the Price Is Right and the Wheel of Fortune. Family was everything to Rose and being a grandma was her life passion. She will always be remembered for her devotion to family, her strong Christian faith, and her legacy of love that will be carried on in the hearts of all who knew and loved her. Left with wonderful memories of Rose are her children, Eleanor (Donald) Miller, Rosella (Eugene) Faul, and John Kuntz; daughter-in-law, Lenore Kuntz; 7 grandchildren, Cliff Miller, Rachel Kuntz, Rhonda Hanson, Rebecca Massey, Sarah Kuntz, Samantha Kuntz, and Sandra Kuntz; 9 great-grandchidren, Jacob, Emily and Wyatt Hanson, Taylor Kuntz, Jameson, Caitlyn, Caleb and Eli Massey and Ethan Hartman-Kuntz; her sister, Margret Kuntz; and numerous nieces and nephews. She was preceded in death by her husband, Mathias; parents, Ernest and Regina Barnhard; son, Mathias M. Kuntz; infant son, Joseph; brother, Adam Barnhard; and her sister, Veronica Barnhard. In lieu of flowers, memorials may be made to a charity of donor’s choice. Go to Rose's Tribute Wall to sign the online guestbook and share memories with her family.